Brava Beach gets its nickname “Beach of the Fingers” from the sculpture of cement fingers seeming to rise from under the sand. PUNTA DEL ESTE — A steady rhythm pulsates through Brava Beach, a sun-drenched surfers’ haven along the Atlantic Ocean. Such heavy percussion in January, the height of the summer season in the Southern Hemisphere, usually signals the kickoff of the International Jazz Festival or the onset of Carnaval. But this is different. The persistent pounding emanates from the future site of the $100 million Trump Tower, the first signature building commissioned in South America by real estate magnate Donald Trump. Completion of the 25-story luxury condominium project with apartments priced up to $3 million is slated for 2016. Trump is not the only developer driving a stake into the golden sands of this exclusive beach community. Up and down the coast condos, hotels, and golf resorts are popping up. The flurry of building, coupled with plans for a new convention center, reflects Punta del Este’s ambition to bolster its cachet as a vacation spot for jet-setters and a premier port-of-call for boaters and cruise ships. Standing in front of the giant thumb of Chilean artist Mario Irarrazabal’s “Monument of the Fingers” sculpture, a symbol of the city since the work’s completion in 1982, we see a construction crane amid a field of glass-wrapped condo skyscrapers. Behind us, couples spread blankets on the warm sand, and surfers nose their boards into the chilly water. With 3 million tourists annually, Uruguay is fast emerging from its obscurity as a chunk of land wedged between Argentina and Brazil. In recent years, residents of other nearby countries, and many Europeans, have been scooping up beachfront property that took a nosedive during Uruguay’s economic downturn a decade ago. To date, Americans have been late arrivals at the party, but that’s changing as sun seekers such as Scott Leonard venture farther from home. 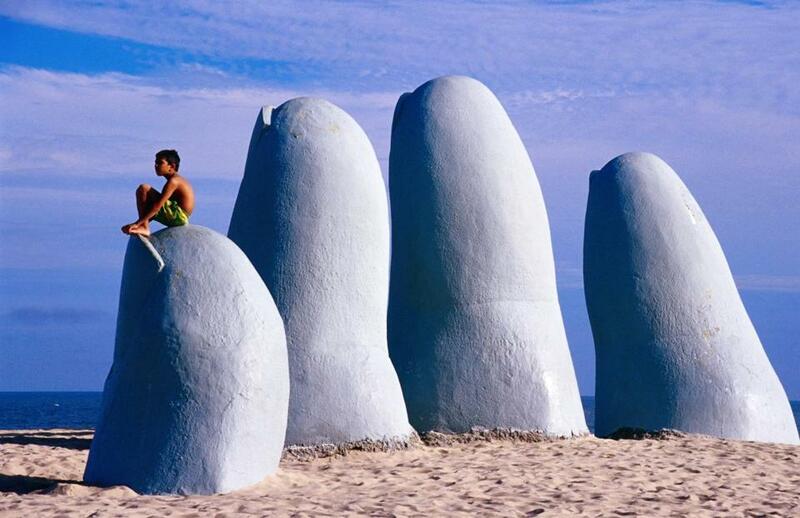 If you go to Punta del Este, Uruguay. . .
“Every year, we go somewhere we’ve never been, and this year we picked Punta del Este,” says Leonard, a military contractor from Atlanta, who rented a seaside apartment with a group of friends for a one-week stay. “I like it here. We’ve cruised all the beaches. It’s very international. Everyone is friendly. And it’s inexpensive.” He and his friends planned to drop a few quarters in the slot machines at the swank Conrad Resort and Casino and then indulge in seafood pasta at an Italian restaurant near the beach. 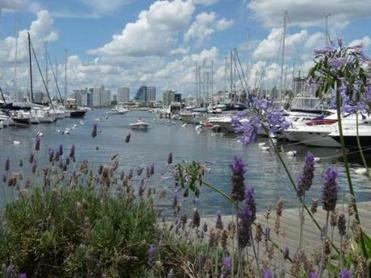 Located 90 miles east of the capital, Montevideo, Punta del Este offers an unbeatable combination of surf and turf. Hanging like a silver teardrop from the tip of the city of Maldonado, the peninsula is lashed by the Atlantic on the east and lapped by the gentle Río de la Plata on the west. In a single day beachgoers can ride the frothy breakers at Brava Beach and walk five blocks across town and sunbathe on the sandy shore at Mansa Beach. Punta’s upscale port and marina nestle along the Rambla, where chic outdoor cafes in sight of million-dollar yachts serve up chilled pitchers of sangria and pan-fried seafood fresh from the nearby waterfront market. The trendy shopping district, anchored by Gorlero Avenue and 20th Street, entices with stores such as Pierre Cardin and Indian Emporium. Uruguayans eat their main meal at noon, when the air fills with aromatic smoke from grilled beef and spicy sausage. Tannat wine, the national favorite, flows from bottles labeled by local vintners such as Stagnari, Juanico, Bouza, and Spinoglio. People-watching is a popular pastime. At sunset streets teem with twentysomethings headed for a night on the town. After dinner one evening at El Tonel, where the chef grilled our steaks over a blazing wood fire, we joined the throng and walked to Mansa Beach to gaze at the city’s jeweled lights ringing the shoreline. While Punta del Este is by far the prima donna of Uruguay’s seaside resort towns, it is only the starting point for exploring beach communities. On our travels we frequently veered off coastal Route 10 to follow winding country roads leading to wind-whipped beaches, towering lighthouses, rustic seafood bistros, and historic hotels. We got our first glimpse of caramel-colored sand several hours after our flight touched down at Montevideo’s Carrasco International Airport. We drove east to Fortin de Santa Rosa, where we had booked an overnight stay in a Spanish-style hosteria. From the front yard, we clambered down a steep hill through a stand of tall pines and emerged on a broad, unspoiled stretch of beach. A few days later we drove from our time-share condo at Solanas Forest Resort in Portezuelo through rolling cornfields and pastures to Piriapolis, a friendly port with Pan de Azucar, a loaf-shaped hill, rising behind it. Monstrous waves pounded the palm-fringed beachfront along the Rambla, sending us scurrying for cover in souvenir shops. At the far end of town, we ducked into the Argentino, a palatial stone hotel from the 1930s. The lobby’s crystal chandeliers, mosaic-tiled floors, and magnificent stained-glass window reflected the elegance of a bygone era. Around the port and marina in Punta del Este, on Uruguay’s southern coast, are places to dine, to people-watch, to yacht-envy. Portezuelo Beach, just west of Punta Ballena, was peppered with blue-striped beach umbrellas the afternoon we visited. An attendant outfitted us with low-slung plastic lounge chairs and an umbrella. At the far end of the beach, disco music blared from the outdoor deck at Gecko bar. Later we ate at Medio & MeDio restaurant, just up from the beach, where we savored platters of grilled linguado (fish). Early one morning we made a mad dash through Punta del Este before the traffic ground to a halt and zipped across the Leonel Viera bridge bound for Jose Ignacio, a small, ultra-exclusive beach town. We were in for a surprise when we cruised through La Barra and Manantiales, which began as quaint fishing villages. Instead of wooden boathouses and fishermen mending nets on the dock, we saw high-density condos, bistros, tiki bars, fish markets, art studios, and beachwear shops. It took five or six miles before graceful dunes and rocky shoreline reclaimed the panoramic scene. On our final day in Uruguay we were traveling west on Route 10 toward the airport and decided to stop for lunch at Atlantida, a lively family resort community with wide pleasant beaches. Our quest for one last memorable beach was rewarded at the Indigo Atlantida, a rustic bar-restaurant with a palm frond-shaded wooden deck overlooking the water, where we ordered a plate of merluza (hake) caught just four hours earlier and sautéed in butter. Whether it was the million-dollar view or the delectable fish, we decided we might have saved the best beach for last. Claudio Capos can be reached at capocomm@sbcglobal.net.